The BBC grew some "huevos" today and ran a report on the ongoing use of near slave labor on Bolivian plantations. Pretty appalling to think this is going on in the Americas. A friend of mine, whose father made his way to the United States selling cabbages on the streets of post-war Korea proposed a question to me the other day. "What is the big deal in particular about Bolivia? After all, you have seen Slumdog Millionaire, there's really poor people everywhere and I'm sure India has a lot more and a much dire levels of poverty than Bolivia does." Perhaps his perspective has some truth to it. It does not however, change the fact there is a democratic country in the Americas which has pockets of slavery. I say pockets because I am sure this is a one of the extreme examples the media has chosen to focus on, hurting the Bolivian farmers out there who are good people, who do treat their workers fairly and are just trying to earn a living. "A senior UN official recently described as "unacceptable" the alleged forced labour of indigenous people by landowners in Bolivia. The BBC's Andres Schipani reports on the contentious issue of "slavery" from the eastern province of Santa Cruz." "All my life I've been here and at the end of it I have nothing and have nowhere else to go," she says. Her hamlet of 13 Guarani families - all workers on the plantations near the town of Camiri in Alto Parapeti region in the eastern province of Santa Cruz - built a school but ranchers destroyed it, she says. "They didn't want us to learn, they want things to be like they always have been," Teresa's granddaughter, Deisy, says. The other side, a.k.a, the owners of the large plantations has this to say for themselves. "The idea that there is slavery here is absurd … Offering loans and selling food is not a debt trap but a favour because there are few banks and shops in the region," says Eliane Capobianco of the rancher's association Fegasacruz, in the eastern city of Santa Cruz, the opposition heartland. Jim Rogers: "We are going to have serious food shortages in a few years"
Jim Rogers sits down with Bloomberg host Haslinda Amin in his home base of Singapore. Haslinda gets a full twenty minutes to test his patience while she asks what his opinions are on investing in a variety of investment categories. Commodities. Currencies. North American Natural Gas. Yen Carry Trade. Agriculture. Equities. ETF's. As usual, Jim Rogers is sticking to what he knows best-raw materials. If you're a new reader, or have not heard of Jim Rogers definitely run a search on the right of his name to bring up past posts and videos including him. Japan never ceases to amaze me. When I first traveled to the island I was an angry, impatient New Yorker. I decided to stop over in Japan to visit a old friend of mine on route to Beijing for a semester abroad. I had no idea what I was getting into. I spoke a bit of Chinese, but no Japanese, and had prepared little else besides a youth hostel in Tokyo for my first week in the country. I got off the subway at Asukasa, drenched in sweat from some of the worst August humidity I have ever felt in my life—and trust me I have felt bad humidity... The beginning of the Amazon in the province of San Martin, Peru or the swamps of Louisiana do not compare. After twenty minutes of wandering I was drenched from head to toe in sweat. I walked into a laundry mat and before I could talk three workers quickly helped me inside. They handed me a glass of water, a cold washcloth and offered me a seat. Today, Bloomberg ran a interesting story on the return Yen carry trade, which is when traders in Japan take out cheap loans at Japan's 0.1% interest rate and invest it in higher yielding foreign bonds where the interest rate is higher. The article talks about the return of “housewives.” Housewives you say? As it turns out, housewives usually manage investing their family savings. Japanese families currently have a incredible $14.9 trillion in savings! “They’re seeking higher returns after the central bank cut its benchmark interest rate to 0.1 percent. Investors who sell the yen against the euro would earn 3.4 percent by year-end, compared with 0.25 percent in one-year yen-denominated deposit accounts, data compiled by Bloomberg show." Question: If Japan has all this capital sitting on the side lines, would it not be wise to figure out a way to invest a higher portion of it in Japan? Japan's central bank is essentially stuck in a catch 22. On one side the low interest rate stimulates growth by encouraging lending. However, if the money being lent is invested internationally in foreign bonds that yield a higher rate of return than a Japanese savings account, the true goal maintaining low interest rates is not being achieved. The way things stand at the moment, Japanese savers are technically helping fund Australia's huge budget deficit through the purchase Australia's higher yielding bonds. I'm sure the matter is more complicated than my gross simplification. I welcome comments from someone more familiar with Japan's financial sector. One year ago, Sichuan Province was struck by a devastating 8.0 magnitude earthquake. Thousands of visitors flocked to Sichuan province to pay their respects to the victims of the May 12th earthquake which killed over 80,000 people. In Beichuan, a valley town totally wiped out by the 8.0 magnitude quake, family and friends gathered to light incense and ritual paper money to comfort the dead. “I feel that this earthquake is not over yet, every time I see something related to the earthquake I feel like crying." The worst devastation was in Wenchuan where nearly 24,000 died or went missing and Beichuan county where 20,000 of its 160,000 residents perished in the quake. Last year China hosted the Olympic games. It was also forced to deal paralyzing snow storms, worse than usual flooding during monsoon season (their equivalent of hurricanes) and oh yes... the most devastating earthquake in terms of power and damage since the quake which caused the Tsunami in few years back. I think some credit is due. Good job China! There were several very positive statements made by the CEOs of major natural gas producers about the changing supply/demand dynamics of the business on their company earnings conference calls with analysts. Mark Papa, CEO of EOG Resources, Inc. (EOGNYSE), said he expects the impact from the decline in gas-oriented drilling will result in natural gas production falling by 4.5 billion cubic feet per day (Bcf/d) by the end of the year.He believes the resulting North American natural gas production declines could be reversed by early in 2010 if $7 per Mcf gas prices return or the gas-directed rig count falls below 650. This view compares with that of the Petroleum Industry Research Association (PIRA) that believes gas production will be 3 Bcf/d lower at year end. Equally bullish was Aubrey McClendon, CEO of Chesapeake Energy (CHK-NYSE), who sees gas storage being full by October and that gas production would be 10% lower at year-end compared to 2008. That implies natural gas production should fall by 4 Bcf/d. Should these estimates prove accurate, the supply drops would go most of, if not all, the way to wiping out the perceived supply/demand imbalance in the domestic gas market of about 5 Bcf/d due to the falloff in industrial and commercial consumption related to the economic recession and credit crisis. China National Petroleum Corp. and Venezuela plan to build two oil refineries in China, Jiang Jiemin, the president of the Chinese company, told reporters in Beijing today. China's EXIM bank placed as a condition on its consent to provide a US$400mn loan to the Trinidad & Tobago government to build the Alutrint aluminum smelter - in the La Brea region of Trinidad island - that the project hire Chinese contractor CMEC to provide labor and technology for the plant, Alutrint manager of communications and community relations Josieann Richards told BNamericas. The construction of the China-Russia oil pipeline conforms with the strategic goals of China and Russia to diversify the former's energy imports and latter's energy exports, Chinese Ambassador to Russia Liu Guchang has said. Peru hopes to complete 70 percent of free trade negotiations with South Korea this week because of the similarities found between the two negotiating teams, allowing them to progress quickly, Peruvian chief negotiator Nathan Nadramija said Monday. During the first round of FTA Negotiations in Seoul on March 16, both countries successfully concluded four chapters relating to electronic commerce, border services, as well as two other chapters related to institutional issues. India’s Jindal Steel & Power has started producing natural gas in Bolivia that will be exported to Argentina, a company executive told Efe on Monday. Luis Carlos Kinn, manager of Jindal subsidiary Gas to Liquids Internacional S.A., confirmed the successful completion of the first production test at the well drilled in the El Palmar field, some 50 kilometers (31 miles) from Santa Cruz, the capital of the likenamed eastern province. The Chilean government is willing to study the proposal by a group of architects that would provide landlocked Bolivia with access to the sea through a tunnel to an artificial island in the Pacific Ocean. Jesus Alberto Garcia, Venezuelan ambassador to Angola, stated in an interview with Radio Nacional de Angola that Banco de Desarrollo Económico y Social de Venezuela (BANDES), the state development bank of Venezuela, will open a branch in Angola. He added, “This is one of the main things President Chavez wants to do with Africa.” Branches of BANDES outside of Latin America and the Caribbean include Syria and the Republic of Mali. Spain’s King Juan Carlos and Prime Minister Jose Luis Rodriguez Zapatero said Monday that the upcoming bicentennials of Latin American independence should be used to promote Spanish and European Union ties to the region. James Reynolds is the BBC's Beijing correspondent. The following excerpts and video have been been compiled from his most recent article, published at his BBC blog. "I've just been down to Sichuan to see what things are like a year after the earthquake which killed more than 85,000 people...."
The Sichuan earthquake has now taken a prominent place in this national story. The government's response was portrayed as quick and compassionate. The Premier, Wen Jiabao, was cast as the noble hero - the leader who cried with the bereaved and who promised that fallen towns would one day rise again. This is the official legend of the earthquake. It's what ordinary Chinese people are told - and it's probably what most of them genuinely believe as well. On a hilltop overlooking the ruins of the town of Beichuan, hundreds of Chinese tourists now queue up to buy pieces of this legend. Vendors sell picture books and DVDs of the disaster, incense and candles to be placed on memorials. But these tourists know almost nothing of the parents' story. Since early June 2008, the Communist Party has banned the Chinese media from covering the parents' campaign. Over the last year, local officials have harassed, sometimes even attacked the parents in an effort to keep them quiet. Click here to access Reynolds full article @ his BBC blog. Alan Wheatley is an intelligent journalist with years of experience reporting news in both Taiwan and mainland China whom I respect a great deal. Alan's article does a superb job of combining hard data with different points of views from experts on all sides to present a unbiased report. This is the general principle Reuters journalists follow. By providing the reader with the necessary perspectives and hard data to back them up, the reader is expected to make their own decision on the significance of the article. As there always are, I am sure some bad apples exist. After a internship with Reuters Beijing Bureau back in 2006, I can personally testify that the Beijing staff makes a concerted effort to uphold the journalist's creed and report both sides of the story. With no fanfare, a $5 billion (3.3 billion pounds) refinery in which Saudi Aramco has a 25 percent stake quietly began processing oil a couple of weeks ago in eastern China. China's exports to the 22 members of the Arab League jumped to $62.3 billion last year from just $7.2 billion in 2001, the year China joined the World Trade Organisation. The share in total Chinese exports rose to 4.4 percent from 2.7 percent. Imports from the Arab world over the same period grew to $70.3 billion from $7.5 billion, doubling the share in total imports to 6.2 percent, according to official Chinese data. Nowhere is this more in evidence than in Yiwu, a town in eastern China whose vast wholesale markets draw traders from across the globe in search of cheap consumer goods. "We don't see too many Europeans any more. These days, most of our customers are from the Middle East," Zhu Shanshan, a sales representative at Dove Candle, which sells scented candles and handicrafts, said on a recent visit to Yiwu. Crude oil fell on speculation that last week’s 10 percent advance will be undone as U.S. inventories climb and fuel consumption declines. Oil followed equity markets lower today, reversing gains made last week after the U.S. economy lost fewer jobs than expected. Crude inventories rose to the highest since 1990 in the week ended May 1 as fuel consumption tumbled, an Energy Department report showed last week. Futures fell for the first time in four days on speculation last week’s 22 percent rally was unjustified. Copper prices fell for the third straight session in New York on signs that demand may ease in China, the world’s biggest user of industrial metals. Gold and silver prices dropped in New York on speculation that investment demand will decline as more signs emerge that the global recession may have touched bottom. [Reuters Video] - China's central bank says the $580 billion stimulus measures are having a better-than-expected impact on the economy, with more action likely. Brazil and Argentina are nearing agreement on a “precautionary” measure to create a $1.5 billion credit line to help boost liquidity amid the global financial slowdown, ministers from the two countries said. As many as seven countries, including Argentina and Uruguay, may establish reciprocal credit lines to help boost liquidity in South America, Brazilian Finance Minister Guido Mantega told reporters in Buenos Aires. Argentine Economy Minister Carlos Fernandez said the credit line with Brazil would be for the equivalent of $1.5 billion in local currencies. The Second Round of Negotiations for a Free Trade Agreement (FTA) between Peru and the Republic of Korea will be held in the Peruvian capital Lima on May 11-14, the Ministry of Foreign Trade and Tourism (Mincetur) reported Sunday. On Monday, the negotiating teams will discuss issues such as dispute settlement, trade remedies, temporary entry, investment, sanitary and phytosanitary measures, cooperation, rules of origin and public purchases. On Tuesday, they will discuss trade in goods, intellectual property, telecommunications and financial services. On Wednesday, the meeting will focus on institutional and labor matters, financial services and competition policy. On Thursday, issues to be discussed include customs and trade facilitation, services and investments, as well as environment. Zambia on Friday selected Chinese company NFC Africa as the new investor to run the closed Luanshya Copper Mines (LCM), which is due to restart production at the end of May. "It is now with great pleasure that I announce the sale of the 85% shares to China Nonferrous Metals Mining, commonly known as NFCA," Zambia's President Rupiah Banda told former Luanshya Copper Mines workers at a public meeting. *** Venezuela is a difficult subject to report on. Unless you dig, finding reporters/ journalists with integrity who strive to present a story that is unbiased, it is extremely difficult to get accurate perspectives on the country. Therefore, when reading articles from major media I tend to focus on the hard data from reliable sources and perspectives which come in the form of direct quotations of "experts," whom represent different points of view. I then disseminate the entire article and form my own opinion. 1. Bloomberg, a U.S financial news giant that loves capatalism and therefore tends to look down on such things as nationalization of private industry. 2. The Latin America Herald, a publication which does a concise job of reporting on all the major headlines that are worthy (in its opinion) for its fan base of wealthy Miami/Ft. 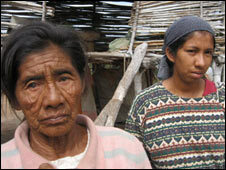 Lautherdale dwelling Latinos. Ok, here we go. Lets start off with a more feel good story about martial arts in Caracas. Ask most residents of Caracas what the city's biggest problem is, and the vast majority will say "crime". Official figures show a huge increase in violent crime in the Venezuelan capital over the past decade, reaching a total of 130 murders per 100,000 population last year compared to 63 per 100,000 in 1998. Little wonder then that demand for self-defence classes is at an all-time high. Some martial arts teachers report a five-fold increase in their attendance levels over the past few years. "My classes have become noticeably larger in the past months," says Karin Yamur, who teaches taekwondo in different parts of the city. Venezuelan President Hugo Chavez seized assets from 60 oilfield services companies including Oklahoma-based Williams Cos., using a law the national assembly passed yesterday. Venezuelan President Hugo Chavez’s seizure of assets at 60 oilfield service companies threatens to reduce the OPEC-member country’s output. Venezuelan President Hugo Chavez said land should be considered the property of the people and ordered the government takeover of a group of farms that he said were being underused. An “arsenal of war” including high-powered rifles, grenades, explosives and a flame-thrower, was seized Friday from the home of a French citizen residing in the Venezuelan capital, authorities said. Conatel, the agency that regulates telecommunications and broadcasting in Venezuela, notified Globovisión television of a suit being filed against it for reporting on this week’s moderate earthquake in the Andean nation before any announcement by officials or state-run media. A definitive agreement for the launching of the Bank of the South was reached in Buenoes Aires on Friday afternoon. Everything seems set to go with one minor change to note, The Bank of the South will begin operations with $7 billion in working capital, not the $10 billion reported previously. Here's the scoop from what went down over in Buenos Aires on Friday, courtesy of MercoPress. China Petroleum & Chemical Corp., Kuwait Petroleum Corp. and an overseas oil producer plan to build a $9 billion refining and petrochemical plant in southern China’s Guangdong province, according to the head of China’s energy authority. Brazil's Vale, the world's largest iron ore producer, shipped 34.63 million tons of iron ore to China in the first quarter of 2009, which marks a quarterly record, the company announced on May 6. China’s investment growth probably accelerated as a decline in exports moderated, strengthening a fledgling recovery in the world’s third-biggest economy. China needs stronger steps to promote public preparedness and early warning systems for natural disasters, experts said ahead of the one-year anniversary of the Wenchuan earthquake. South Korean banks are grappling with deteriorating asset quality amid the economic downturn, which according to the country’s financial regulator led to a 75 per cent drop in combined profits in the first quarter. SEOUL: South Korea Sunday unveiled plans to establish an 802 million dollar fund for investment in overseas mineral mines, oil fields and gas wells. State Bank of India reported fourth- quarter profit rose 46 percent to a record, exceeding analysts’ estimates, as lower lending rates lured borrowers and gains from trading grew more than fivefold. Net income rose to 27.4 billion rupees ($556 million), from 18.8 billion rupees a year earlier, the nation’s largest bank said in a statement to the Bombay Stock Exchange today. That beat the 21.7 billion rupee median estimate of five analysts surveyed by Bloomberg. Australian Prime Minister Kevin Rudd’s bid to ensure his housing market avoids the global property slump may push a generation of buyers into a debt crisis. Grants of as much as A$21,000 ($16,142) to first-time buyers and the lowest interest rates in 49 years have emboldened more than 40,000 young Australians to take out home loans since October, stoking demand for properties that cost less than A$500,000. Energy and Resources Minister Gerry Brownlee has announced a renewed seismic survey program to encourage New Zealand oil and gas exploration. As part of Budget 2009 a total of $20 million over three years will be allocated to the seismic data acquisition program run by Crown Minerals, which is responsible for the administration and promotion of New Zealand's oil and gas.